With Gerald Nosich. Strategies for encouraging students to think critically by designing assignments that require them to discover. Good for all levels. Topics include: Why discovery motivates students, why students remember what they discover, recreating historical discoveries, and discovering naïve misconceptions. 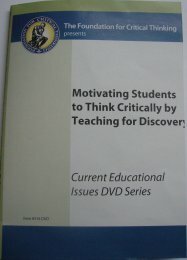 316DVD Motivating Students to Think Critically ( DVD) $9.95	 Qty.